I love my daughter. It's as simple as that. Carissa went to McDonald's with the grandparents yesterday and was enjoying the toy and "hat" that came with the meal. Carissa spends much of her outside time behind our house on the deck. 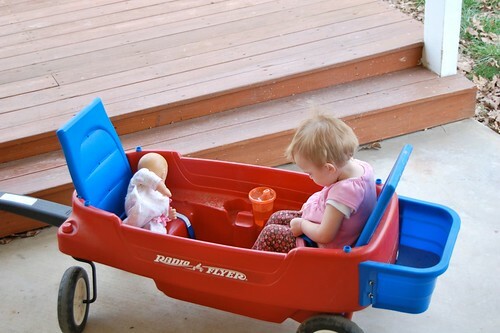 Lately she likes to sit in her wagon. On this particular day, she also had her baby doll and a cup of milk with her. She was living the dream life. We've been enjoying being outside on our deck like crazy lately. Carissa would live outside, if she could. 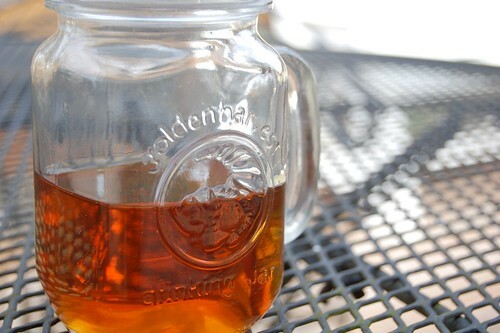 Summertime and sweet tea, here we come. Just so everyone knows, Carissa feels that she must eat like a big girl. 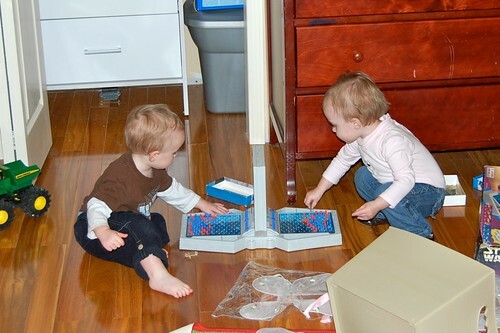 Carissa and her friend Corbin played a lively game Battleship on Saturday at another friends birthday party. They seriously sat down at the game all by themselves. That's awesome. St. Pat's is definitely special in this town. We had a blast this last weekend here in Rolla. 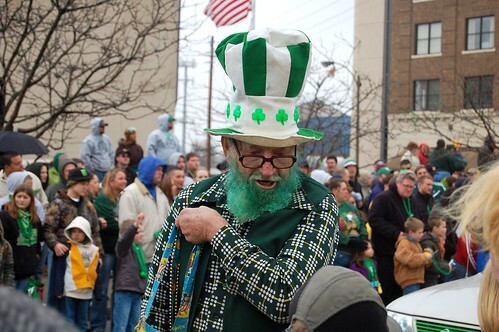 At Missouri S&T, they've been celebrating the 102nd Best Ever St. Patrick's Day on campus and the parade was Saturday. Here at church we collected and gave away 800 hotdogs, coffee, and hot chocolate before the parade. When we got done there we walked a few blocks to enjoy the parade ourselves. 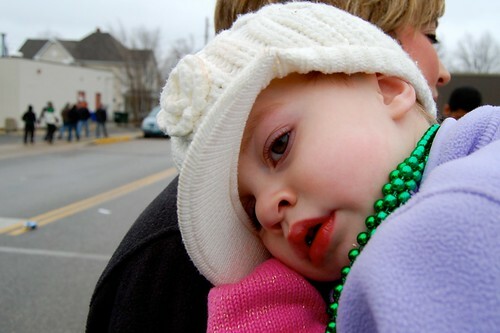 After about an hour and a half of the parade, Carissa was getting tired of it. But she walked away with some fun beads. We had our annual Vineyard Leaders Retreat this past weekend. 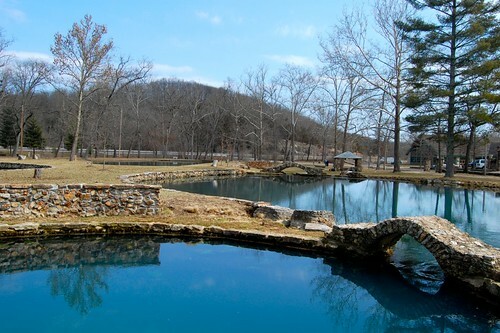 We've had it at Camp Mihaska the past several years and it was beautiful this year. The sun was out and the spring was amazing. We've got the capri pants and sandals busted out and we are ready for summer. We had a beautiful day today. 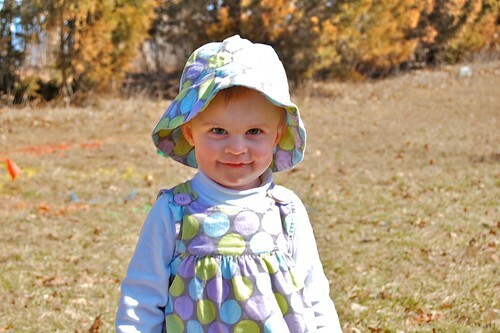 We even ate lunch on our deck and Carissa got to run around in the yard. She loves being outside. The weather was fantastic this past weekend. 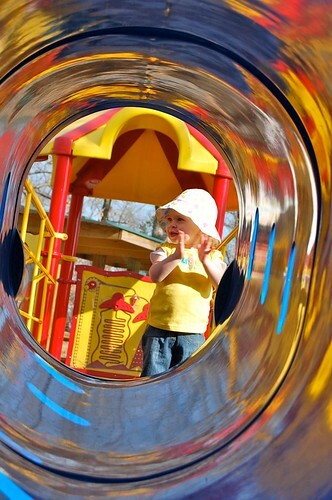 We got spend some time at a local park and Carissa is getting big enough to really enjoy the play gym. This is probably Carissa's favorite way to be dressed around the house. 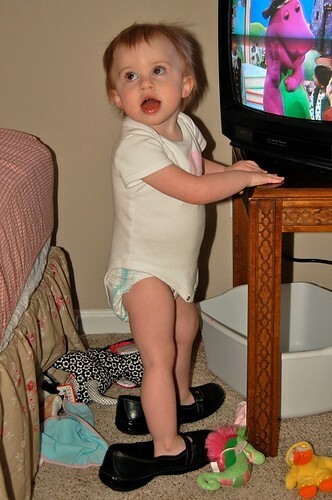 Mom's shoes and no pants. And of course watching Barney 6 inches from the screen. We honestly try to keep her from doing that. Today the St. Louis Cardinals will play their first spring game. They may be in Florida buy I'm supporting them here. 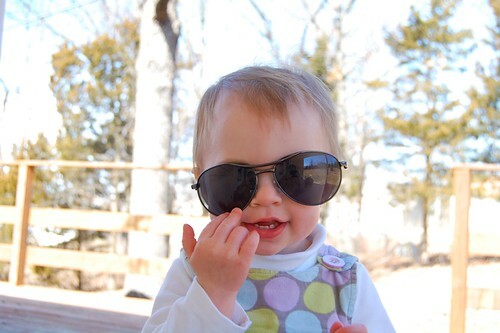 Carissa loves my sunglasses. Too bad they're a bit too big for her. The weather is slowly getting warmer here and Carissa just can't be outside enough. She was all dressed up for church and wanted to get out.